The South Australian voluntary euthanasia bill as presented to the state parliament is not what should be enacted, writes disability consultant Tricia Malowney. Recently I was invited to travel to Adelaide to meet with a number of people who had concerns with a bill which would legalise euthanasia, as it is tabled. The structure of the meeting ensured that those who have an interest in the issue, whether as a person with a disability or as an advocate for people with disabilities, are able to express their very strong concerns about the impact of the bill on their lives, as well as articulating their fears. It is quite clear that the South Australian voluntary euthanasia bill 2016, as presented, is not what should be enacted. It has gaps in it that only feed the fears of those who believe that their right to life will be impacted by the introduction of euthanasia legislation. Euthanasia legislation is going to be passed eventually and it is absolutely imperative that people with disabilities ensure that it is the strongest possible, so that we can make sure that no one else can make decisions about our lives. It is my body and what happens must be my choice, and we need strong legislation to ensure that is what happens. We need legislation that excludes disability as the sole reason for eligibility. We need to ensure that having a disability does not exclude us from the process. Legislation must ensure that family members or service providers or anyone else for that matter cannot make a euthanasia application on anyone else’s behalf. Legislation must ensure that I / we have total control over what happens in my / our life. We need to look at what has happened in other jurisdictions, such as the Oregon Dying with Dignity Legislation that was introduced 20 years ago. We need to have a look at the evidence of what happens when strong legislation is in place, and what happens when people are killed illegally in the name of euthanasia in the absence of strong legislation. We need to guarantee that people with disabilities have access to high quality palliative care. We need to have a process which reviews every incidence of euthanasia, and that panel needs to include people with disabilities. We need to ensure that family members and service providers or anyone else who will benefit financially cannot be a witness to an application for euthanasia. 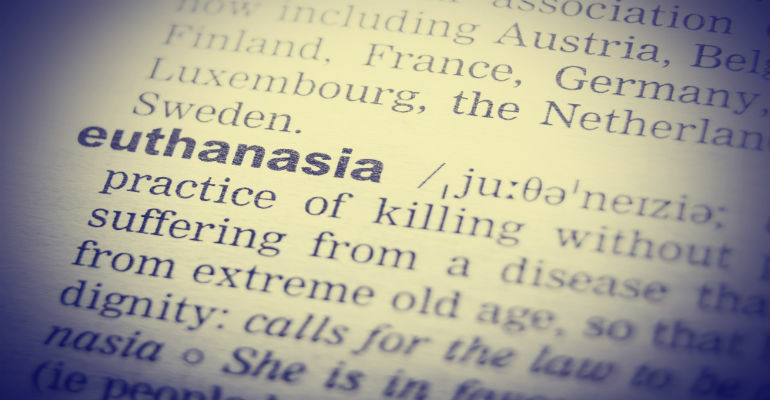 We need to have information about what euthanasia means in languages which can be easily understood. We need to have appropriate supports in place to ensure that I can carry out my wishes. I have taken a fair bit of time thinking about this subject, while I am in a position to understand my options, and while I am still able to make my wishes know to others. In doing so I have been looking at Victoria’s Advance Care Planning (Competent Person) and the Advance Care Planning (Non-Competent Person). I mostly have no concerns with the first document, although, I would ensure that there was more than one witness to my document, including one who had no benefit from my end of life decisions. It is quite comprehensive and includes directive that treatment should continue if that is what I want. I think it is important to note that it also contains a guarantee that my life would not be extended, if that is what I wished. As we know, many people with cognitive impairments do know what they want and, given the right support, will make informed decisions and to see it acknowledged is heartening. We need to ensure that a person’s belief system is taken into account. There is room for improvement, and I would like to see a person other than a family member or service provider is also involved in the decision making process when there is not already a Medical Power of Attorney in place. I am making my plans now. I am letting everyone know what my wishes are, I am appointing a Medical Power of Attorney, and am taking every step to ensure that I am able to die with dignity. Euthanasia legislation is going to be passed. We need to ensure that people with disabilities make sure that it is the strongest legislation possible. This totally supports my view that it is my body, my choice, and that I support the decisions that others make, I only ask that others respect the decisions that I have made. About the author: Tricia Malowney is a systemic advocate for inclusive practices and regular contributor to Pro Bono Australia News. She is a former president of the Victorian Disability Services Board. In November 2013, Malowney was awarded the inaugural Brenda Gabe Leadership Award for her outstanding contribution to women with disabilities in Victoria. She was the inaugural chair of the Royal Women’s Hospital Disability Reference Group and was able to influence policy and planning on key issues including the Family Violence Protection Act 2006. She has successfully lobbied for women with disabilities to be included in the United Nations Population Health Research.